Characters from Andrew Hussie's webcomic Homestuck [mspaintadventures.com]. 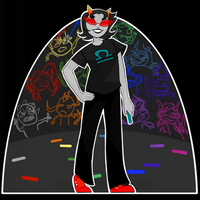 Homestuck trolls Nepeta Leijon, Kanaya Maryam, Terezi Pyrope, Karkat Vantas and Vriska Serket. Inked with Copic F02 Drawing Pen on paper. Colored in Photoshop CS6. This is so great!!!!!!!!!!!!! ;;;OOOOO I love this so much! Really good job!